A group if illegal Israeli colonizers invaded, on Monday at dawn, Beit Iksa village, surrounded by the Wall northwest of occupied Jerusalem, punctured tires of many Palestinian cars and wrote racist graffiti. Mohammad Abdul-Aziz Awadallah, a member of Beit Iksa Local Council, said the assailants carried their attack out in the southern part of the village. Awadallah stated that the attack is not the first, especially since the village became surrounded by the Annexation Wall and several illegal colonies and called on the international community to intervene and stop these serious and escalating violations. Naim Gheith, also a member of the Local Council, said such attacks are frequent, especially since the colonizers previously burnt two cars owned by his sons, and attempted to torch the local mosque, but when they failed to do so, they wrote racist graffiti. In an earlier attack, the assailants punctured tires of ten cars, and wrote racist graffiti, he added. Beit Iksa, inhabited by 1800 Palestinians, is also subject to constant Israeli military invasions. Most of its residents had to leave due to the Wall and Colonies; it is the only remaining Palestinian village, west of Jerusalem. 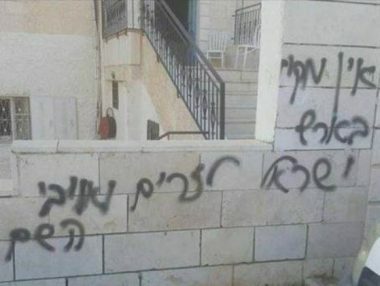 Jewish settlers who are members of the outlawed terror group “Price Tag” attacked, for the second time on Monday, a Palestinian village, where they vandalized vehicles. Residents of the village of Ramoun, east of Ramallah, told WAFA that settlers broke into the village during the night and vandalized three cars, slashed their tires and wrote hate slogans. They said that residents noticed the settlers and chased them, forcing them to leave the area into the nearby valleys.